Websites Wala gives you a one stop solution for all your eCommerce related queries, The solution given by our team of experts meet the requirement of the current market strategies and trends there by giving our client the required edge over their competitor to kick start the business online like never before. 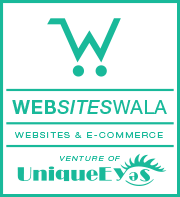 WEBSITESWALA.COM, a sister concern of UniqueEyes was launched in 2013 as a specialised wing to cater the needs to the fast growing ecommerce industry. By one stop solution we mean, taking care of your most elementary need right from helping you find a domain name which is the face of your website to developing and designing it which is the body of your business and keeping it healthy by providing all the nourishment required for it. Like, online marketing, up-gradation according to the market needs and last but not the least secure hosting of your website. We’re a dedicated, friendly and talented team. Every member of our team has spent many sleepless nights polishing professional skills and earning a unique experience to meet your requirements & to get your dreams carted. We specialize in building modern, progressive web and ecommerce websites, We ensure that your website is built with a sound business strategy & cutting edge development technologies to make the process of getting your ecommerce website launched very quick and easy. From the website design, to product management, SMS Integration, payment integration, advertising & training we’ve got you covered. We have significant experience in building ecommerce websites on a secure and robust platform. Enter the world of websites wala to receive the best technical solutions and the best support till the end of time. Let us work on Your IMAGINATION.